There’s no question that the vegan trend is on the rise; with more than 3.5million Brits now identifying as such, there’s no sign of it slowing down anytime soon*. 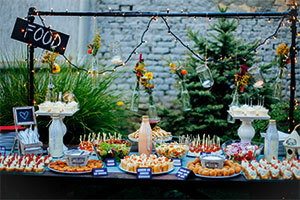 With more and more of us switching to a fully plant-based diet, there has also been a rise in vegan celebratory foods at parties and even prospective couples having a vegan wedding to fit their ethical beliefs. The thought of a vegan catered wedding might conjure up images of raw crudités and vegetable cous-cous, but in fact that idea couldn’t be more wrong, with vegan dishes spanning a huge variety of cuisines. Hugo Campbell, Co-Founder of Feast It, the UK’s leading event catering marketplace, predicts some of the delicious vegan dishes likely to be on the menu at vegan catered weddings in 2019. Introducing Sweet Heart Cart and Events! Sweet Heart Cart Hire is a small family run business based in Bromley, Kent offering our services in London, the South East and the surrounding areas. Our bespoke Sweet Cart has proved to be very popular at weddings, christenings, children’s parties and many other celebration events. We offer our charming Sweet Cart as an exciting addition to your special celebration. We provide beautiful glassware and decor, and are able to customise and colour co-ordinate the sweets according to your own individual theme. Read more about Introducing Sweet Heart Cart and Events! Tapenade, celebration specialist caterer, is offering an extraordinary gift to couples planning to marry next year. All wedding reception bookings made before 31 December 2018 will include a complimentary evening menu for all guests. The offer translates to an average saving of approximately £500 based on 50 guests, allowing the happy couple to put the extra budget towards their special day. Engaged couples are always offered a complimentary sampling session of Tapenade’s award-winning wedding breakfast menu before committing to a booking. During the consultation, they will also be invited to trial their complimentary evening menu, a culmination of easy-to-eat favourites that offers a choice of four different cuisines. Congratulations! You’re engaged, on cloud nine and are in the throes of planning your big day. The date is locked down, the dream dress has been picked and the venue and food are all arranged, just the drinks to organise… Choosing the wedding wine is one of the most enjoyable parts of wedding planning, but there are certainly some important points to consider. Luckily, SlimLine Wine, the world’s first zero sugar zero carb wine range, is here to help with top tips for choosing your wedding wine and making the process as smooth as possible! It’s all too easy to get lost in the hundreds of wine varieties when searching for your perfect wedding bottles, but the number one thing to remember is to keep it simple. Between booking your venue, choosing your favours and picking your bridesmaids, it is hard enough already to find the time to stay healthy in the run up to your big day. But we might just have found the solution! Vitamix blenders have long been the choice of passionate foodies for their speed, reliability and versatility making it easier than ever to whip up delicious recipes that will keep you on track long after your wedding day has finished. John Hearn, executive head chef at Tapenade, one of the UK’s top caterers, talks Vows and Venues through this year’s biggest wedding food trends. Love Your Gut Week 2017 runs from 4-10th September. Love Your Gut has been raising awareness of the importance of gut health for over 18 years by providing expert tips, digestive health news and recipes.